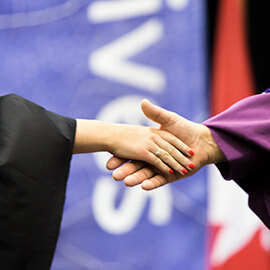 Brantford – Wilfrid Laurier University’s Brantford campus will hold convocation ceremonies at the Sanderson Centre on June 5 and 6, 2018. Waterloo campus ceremonies will take place from June 11 to 15. As of May 31, 589 Brantford campus students had met all program requirements and qualified to graduate. One of the degrees conferred at the spring 2018 ceremonies will be a graduate degree; the rest will be undergraduate degrees. Laurier will also honour four Brantford campus faculty members for their outstanding contributions. Three of the awards are for faculty teaching excellence and one is for service excellence and community engagement. Michael Ackerman, assistant professor, English: Sustained Excellence (full-time category). Ackerman will be honoured on Tuesday, June 5 at 2:30 p.m.
Danielle Law, associate professor, Youth and Children's Studies; Psychology: Early Career Excellence. Law will be honoured on Wednesday, June 6 at 10:30 a.m. Read more about her teaching. Stacey Wilson-Forsberg, associate professor, Human Rights and Human Diversity: Excellence in Internationalization. Wilson-Forsberg will be honoured on Wednesday, June 6 at 10:30 a.m. Read more about her teaching. Robert Feagan, associate professor, Social and Environmental Justice; Social Justice and Community Engagement. Feagan will be honoured on Wednesday, June 6 at 10:30 a.m.
All convocation ceremonies are ticketed events. For those unable to attend, live streams of the ceremonies will be available.